In our economy-driven society it is taken for granted, that it is »the economy« which produces the societally necessary goods. However, this is not the case, which can be impressively shown by looking into official statistics. The fact, that quality of life in our society especially needs those works, which are not paid and not taken into account by national economy statistics—like housekeeping, child education, civil engagement, and honorary works—this fact is vividly and highly visible presented by this survey. Before judging the survey—in contrast to the secretary ending her preface with the cited sentence—some results will be presented previously. I will focus on data concerning paid and unpaid labor. Unpaid labor apply to all household activities (so called household production), and care and support as well as honorary activities. 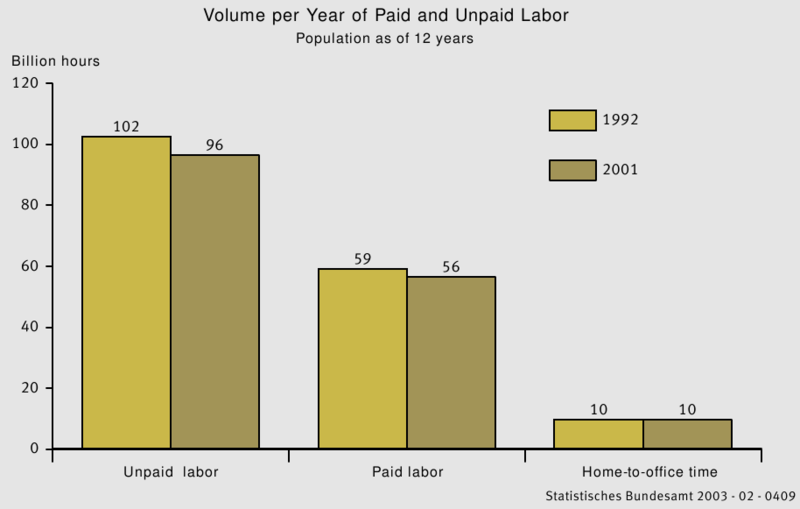 The illustration shown above (click to enlarge) shows the year-volume of unpaid and paid labor, in each case for the period of the first and second survey. By calculating the proportions of labor being entirely necessary in society, one gets a fraction of approx. 63% unpaid and 37% paid labor for both periods (with a minimal shift towards paid labor). However, the home-to-office times had been reported separately. If adding these efforts to unpaid labor (which usually should be the case: although necessary for gainful employment no money is received for it), one gets a fraction of approx. 65.5% unpaid and 34.5% paid labor. All in all one can assume a relationship of two third of unpaid labor to one third of paid labor. Furthermore, if one thinks of the findings of Karl Marx, that the value of the labor power is determined by the costs to re-/build it, then aspects separated by the survey like regeneration (free time, recreation, media usage) and continuing education had to be included as well. However, since the survey is a time based study, monetary costs cannot be determined. Also assisting times for persons needing care are rather underestimated, because »the permanent on-call duty« (Schäfer) is not incorporated. Etc. More points could be mentioned more and more generally questioning the treatment of activities of life as being »labor«—and not only the fact, whether they are paid or not. 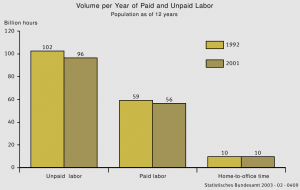 It is funny that the analysis of the survey data tries to calculate the »value« of the unpaid labor. An after tax payment of 6 Euro (1991/92) and 7 Euro (2001/02) respectively is assumed. By adding usual social services the amounts could be doubled. If one is doing calculations already then all pass through used-up and long-lasting goods have to be comprised, too. Finally one ends up with a »household enterprise«, which could be compared with a »normal« business company. Its GDP (gross domestic product) proportion is about 43% and 40% respectively. Calculating base is the after tax payment mentioned above for the »household enterprise«. If one inserts pre-tax earnings or average production wages instead, this would lead to completely different results which means, that numerical games based on monetary values are basically pointless. What does it mean when twice as much of necessary activities in a society are done unpaid than paid? First, one should accept the fact, that this is the case! The »economy« is—in terms of time—not the most important sphere of societally necessary activities. At the same time its logics are totally dominant: Only what pays off will be done economically, will be exploited. In this logics no exploitation means misfortune, poverty, exclusion, crash. The »non-economy« is the other side of the »economy« in a double sense: Without its contributions »economy« would not be possible. »Non-economy« catches all those activities which have to be done but are not exploitable. At the same time it is the pool of potentially exploitable »worthless« things: More and more activities are graped by the logics of exploitation and formed by its image (e.g. commercialized care activities which are scaled by minutes, whereas human attention remains an alien task). Finally, it is not astonishing, that both fields are structured by gender (the survey analyzes the »non-economy« in respect of gender specificity): the »female non-economy« is opposed by a »male economy«. Here we find the same general relation of exploitation and not-yet-exploited: What is currently not the case can emerge in the future. Or the other way around: Whose labor power is exploitable, is allowed to do the physical and psychic clean-up in the split-off »non-sphere«. Who rears pigs is a productive, who rears children is an unproductive member of society. Exactly there we are yet today. D. Schäfer, Unbezahlte Arbeit und Haushaltsproduktion im Zeitvergleich, in: Statistisches Bundesamt (Hrsg. ), Alltag in Deutschland. Analyse zur Zeitverwendung, Forum der Bundesstatistik, Band 43, 2004, S. 247-273 (german).